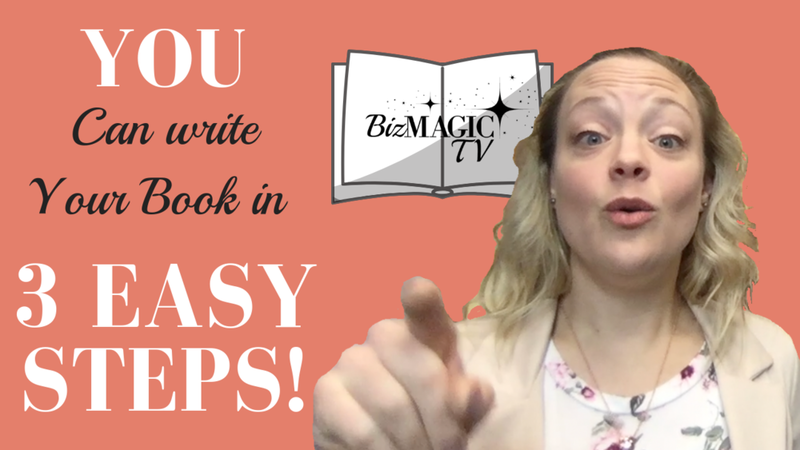 I bet you can’t guess that there’s a SYSTEM that makes your nonfiction book easy to write, right? Well, there is, and I’m sharing it with you in this blog post. Just in case you needed me to tell you, you actually DO need to decide on the topic before you start writing. But there’s a lot more to it than just WHAT you’re writing about. WHY are you writing it? You have to also decide what you want to leave your readers feeling when they’re done. This is almost more important than what you’re talking about. You can inform people, tell stories, teach something, convince them to buy another product from you, empower them, inspire them, really - the list is endless. But you’ll have to decide this, because it affects the rest of your planning. There are a few other points I want to mention while we’re (OK, I’m) talking about topic selection. Make sure it’s relevant. Relevant to you AND relevant to your audience. I mean, if you’re in LOVE with the topic of underwater basket weaving, but you’re trying to reach busy moms who have businesses, your topic selection is probably not relevant. They’d probably love to read your book, and learn how to perform that art (!’m curious too, do you get to come up for air once in a while? And what do you weave with, lake-weeds?) but they don’t have time to practice what you’re teaching them, so they probably will skip over your book on a shelf. If you know something about your topic, and your audience wants to hear about it, you’ll have a good chance of connecting to them. But you’ll also have to show that you know about your topic. You’ll want to select a topic that you know where you can go if you need more information. And, well, search engines are probably not good enough for this. You’ll want real connections to whatever industry you’re writing about. To make a topic interesting - you need to have some life experience with it. I can talk all day about resilience, and I have some HILARIOUS examples in my own life of times when I used it (can YOU claim you’ve pulled off a book signing party with NO BOOKS in hand?!) But what can you share stories from your own life about? It’s not going to be good enough to just collect stories from others (unless you’re writing a book on a collection of stories of others…) Your stories are going to relate to your audience, and give them a sense of who YOU are, and why they should keep reading. After you’re sold on the topic, and why you’re writing a book, it’s time to outline what you’re writing. You want at least 7 chapters. Therefore, you need to be able to make at least 7 main points about your topic. So, decide what your main points are. This will ultimately become your Table of Contents. You don’t have to have the chapters named yet, but you just need to make the points. For each of the main points you’re making, come up with 3-5 sub-points or supporting points you want to make. These points need to be relevant to the main point, but not overlap too much with the other points. I would insert a real example from The Resilience Code here, but I’m going to send you over to read the book instead. So let’s make something up. I have a dog, let’s pretend we’re talking about selecting a breed of dog in our book about owning a dog. So the Main Point is ‘Selecting a Breed’ and then I’d probably use these sub points: Size of breed, temperament, overall health, hairiness, and trainability. In reality, I’ll be honest, I probably couldn’t write this book above, but that’s not the point. I do have a dog, and I love him and trust him with my life. And since I know you’re wondering, he’s a Border Collie-Lab Mix, medium length hair, about 50 lbs, a bit high strung, healthier than a horse, and has been a champ to train. The hunting black lab my husband has, well, that’s another story. But I digress. There’s also such a thing as brainstorming software. If you’re really struggling to get enough sub-points, or want to come up with other ways to say what you’re thinking, you could try Paramind. Right? Who knew? What a useful thing to give us back our own headspace. Let the computer do the heavy lifting for you. So you have your topic, your main points, and sub-points, and now comes a really fun part. (No, we’re not even writing yet!) Now for each of your sub-points, you’re going to brainstorm your examples. These are the stories from your life, with a few stories from others sprinkled in. Add these stories into your outline so when you go back to start writing, you don’t forget what you were thinking when you started. Below is a free download you can use to outline and plan your entire book. You’re welcome. I know you’re starting to panic, because I haven’t even told you to start writing yet. But, now, finally, it’s time to start writing. How will you get it all done?! Let me tell you how I wrote my book. This worked for me, and you may need to adjust this for you, but you’ll see it all work out in the end. Writing happens like this: write a chapter or a section per week. That’s it. When I wrote my book, I literally made a new Google Doc for each chapter, and then added the links to the documents into the outline document, which I kept separate (and changed the sections to strikethrough font as I completed them, since I really enjoy crossing off lists. That part is optional, of course). I chose to do a chapter per week, because I knew it would be manageable. You may be able to do more or less than that, and it’s fine. Do what’s right for you. However, here’s the thing you have to remember. Set a schedule, and then stick to it. Don’t keep pushing out your personal deadlines. If you get into that trap, your book won’t ever get published. And then I’ll have wasted my time writing this blog post to help you. I do really dislike wasting time. A couple of other resources for you that I’ve found people like. If you’re a talker, and think better when you’re speaking than typing (I have at least a few friends who are like this, you know who you are, haha), use a free app called Otter. It records and transcribes your voice for you as you talk to it. Genius. Make sure you’re not in a loud place or out in public where people can see and hear you talking to yourself. Let’s not get a reputation going. I used Google Docs to write my manuscript, but you could also use Scrivener, which allows you to move pages and chapters around really easily. If you happen to have a really long manuscript or you like to change your mind a lot, this is probably a great option for you. And, of course, in the spirit of preaching resilience. SAVE YOUR WORK OFTEN. This is one of the great things about google, since it autosaves for you. But man, don’t throw your work away after hours for just forgetting to click save every so often. Now that you’re ready to get writing, you’re going to be looking for an editor. I’ll just mention I love to edit, and would be more than honored to read your manuscript. You can find out more information here.